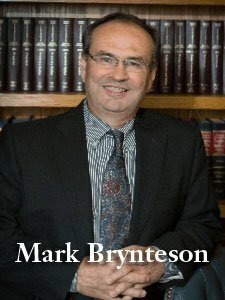 Mark Brynteson is a successful personal injury/transactional lawyer and businessman. He earned his Bachelor of Science Degree in Biochemistry in 1980 and Juris Doctorate in 1989. Following graduation from Law School, he formed his law firm with two colleagues and has been actively practicing for over 25 years. Mark quickly distinguished himself as one of the outstanding trial lawyers in the Tidewater area of Virginia. During his first year of practice, he was a key member a litigation team that won a $5 million wrongful death verdict in the Chesapeake Circuit Court. Since then he has continued to achieve successful results for his clients, now more than $30 million dollars. Mark’s primary areas of litigation practice are medical negligence, wrongful death, and personal injury. Mark works extensively with buyers and sellers of residential property. He knows that real estate transactions involve both substantial investment and risk and that the details of a residential real estate transaction can be complex and confusing. He will devote his undivided attention to every detail of your transaction and promptly respond to your calls or e-mails. Mark also provides Estate Planning Services to the public. He assists people in their estate planning matters, be it the preparation of a will or trust, with personal concern. He believes in education-based planning, with the goal to educate people in their planning options and assist them in making informed quality decisions.